How’s 2017 been treating you so far? Mine has been up and down. But 2016 ended with another blow to my already ‘unsavoury’ year. I have never dropped my electronic devices but it seems that my carelessness lies in taking care of cables. I wrote about how my tablet went bonkers about a year ago because of a broken cable. The tablet has since sadly died from its injury. This time the victim is my MagSafe power adapter. What exactly happened this time is a little bit difficult to explain. It involves a girl, a laptop and a bed… heh make up your own jokes here. As you can see from the photo, the condition of the cable is pretty bad. One moment it was fine, I left my laptop for a few minutes, and when I came back I was shocked to see the state of the cable. The trauma of what happened to my tablet came rushing back. I can only guess what exactly I did to make the cable the way it is by tracing my steps, but I can’t really pinpoint what exactly happened. I didn’t wait to find out if the adapter was still usable and didn’t want to take a chance; I immediately bought a new one. I thought it would be better to be safe than sorry. Upon charging my laptop with the new MagSafe, I was quite surprised to discover something like a vibrating sensation while running my hand over the keyboard, in particular the surface around it, not the keys themselves. I don't feel it if I simply place my hand over. 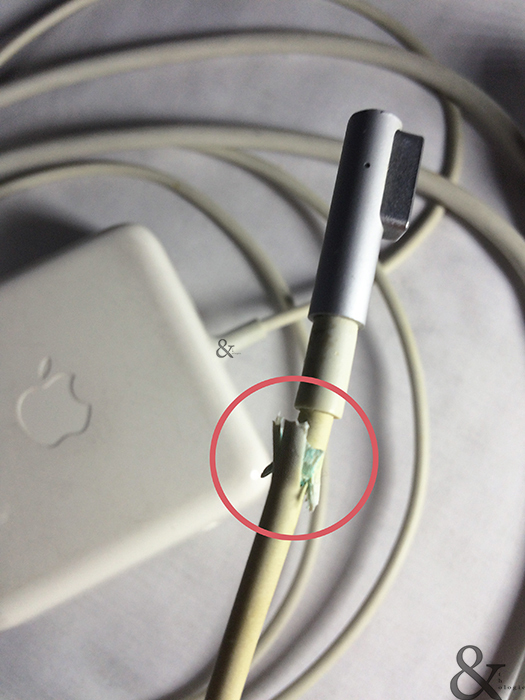 This never happened with the older MagSafe. Also, while charging, the trackpad isn’t quite itself; the cursor jumping here and there and clicking places where none is clicked. I think the vibrating and uncooperativeness are related somehow. Just to be clear, both incidents never happened with the older MagSafe, and my laptop is a MacBook Pro 2011. 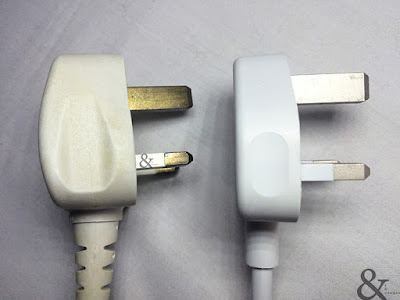 I have since tried the power adapter on another power outlet in my house and none of the problems occurred; so it seems the problem is not with the MagSafe itself but with the power outlet in my bedroom [which is where I usually charge my laptop] and or with this particular MagSafe. https://discussions.apple.com/thread/3874542?tstart=0. Whoever ‘fabinh’ is, give yourself a pat on the back because you have helped a fellow human being tremendously and possibly a lot more others; and I thank you for corresponding to that query; your suggestion has helped me a lot - yes, a lot because I was quite anxious and wondered whether the new MagSafe was broken, or worse, my laptop was broken because of the broken cable. One little thing that bug me; just a little pet peeve [a little little] is the new 3-pin head plug. It is as thick or thin as the iPhone’s 3-pin plug. I’ve never really liked the thinness of it; it makes grabbing the plug slightly difficult especially when your hands are moist or even sightly greasy; when you have some lotion on your hands for example. I can simply change the 3-pin plug and have half of the adapter in the older cable, but that will make the whole adapter half new and half yellowish; not inconvenient at all, just a bit of an eyesore he he. So thin head it is. At least the new MagSafe’s plug is rubberised, so there’s more grip to it unlike the iPhone's 3-pin plug. So, why ‘Fluffy’? Because I’m a panda.